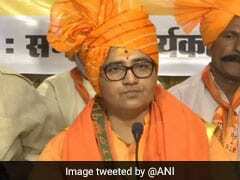 Uttar Pradesh police said the book was a response to the widely-condemned attack on a foreign tourist couple in Agra last month. Police released a book wishing a quick recovery to a Swiss couple attacked near Agra. 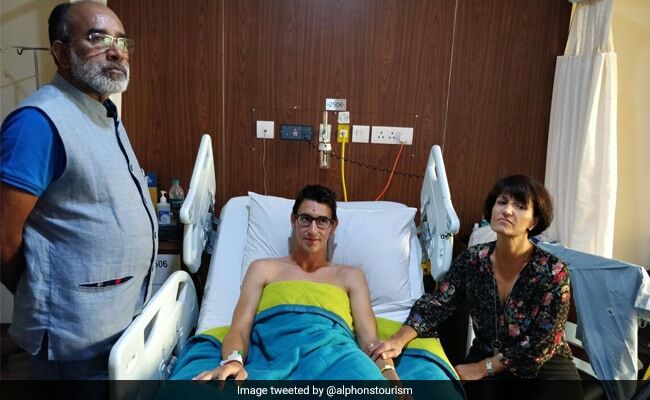 Lucknow: Skewered for its inability to protect tourists after the attack on a Swiss couple last month, the Uttar Pradesh police has come up with what it thinks is suitable reparation - get-well-soon tweets in a book. 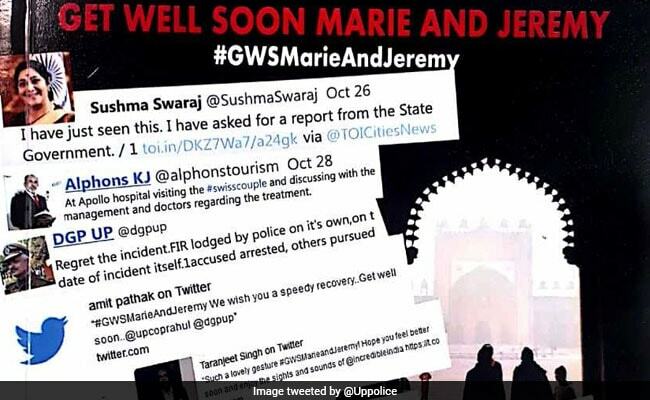 "Get Well Soon Marie and Jeremy" compiles scores of messages posted for the couple on Twitter. 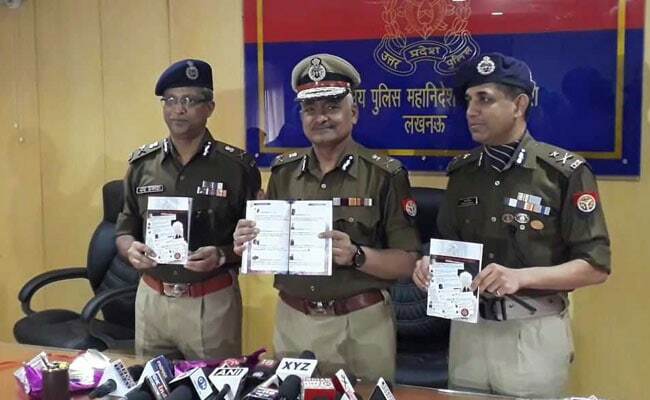 Top officers, including Director General of Police Sulkhan Singh, beamed as they held up copies of the booklet for photos today while releasing the book. 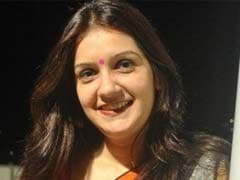 The police had requested people on Twitter to send their wishes to the couple as they recuperated in a hospital in Delhi. The police say they received thousands of tweets from India and the world, the best of which were handpicked for the 76-page booklet. 300 copies are being prepared of the booklet that, not surprisingly, is not for sale. Tourism minister KJ Alphons had visited the Swiss couple in hospital. A copy was earlier presented by the Agra police chief to a representative of the Swiss Embassy in Delhi and to the foreign ministry. Confronting some disbelief over such an exercise, Sulkhan Singh said: "The UP Police aims to strengthen policing, make it more humane and friendly in tourist cities like Agra. This effort is part of the drive." On October 22, Quentin Jeremy Clerc and his girlfriend Marie Droxz were chased by a group of young men and attacked with sticks and stones in Fatehpur Sikri near Agra. Clerc suffered a fractured skull and Droxz was left with broken bones after the vicious attack. 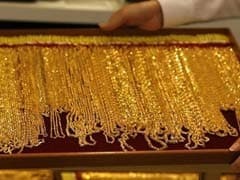 Three boys were among the five arrested. Witnesses took videos of the couple on their mobile phones as they lay wounded on the road. 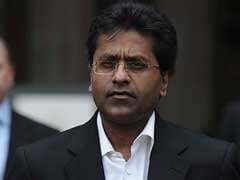 Amid outrage, the couple was offered free stay at a five-star hotel in New Delhi as a "token of concern". Police said they picked the best tweets wishing the tourists attacked in Agra. 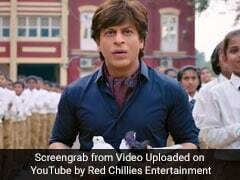 Hit by condemnation over such an incident in a town that receives thousands of tourists each year, the UP police took to Twitter to assure users that action was being taken. Rahul Srivastav, PRO to the police chief, tweeted: "Attn: Convey yr get well soon wishes 2 #Swiss nationals Quentin Jeremy clerk & Marie Droz with #GWSMarieAndJeremy". The "get well soon campaign" was "appreciated by the Swiss embassy," news agency PTI quoted a top official as saying. While many did wish the couple, others questioned whether "get well messages" were the extent of the support that the police could provide for tourists. 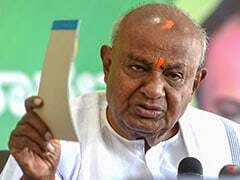 Among the tweets headlined by the booklet is one by Foreign Minister Sushma Swaraj flagging the first news report on the assault: "I have just seen this. I have asked for a report from the state government."